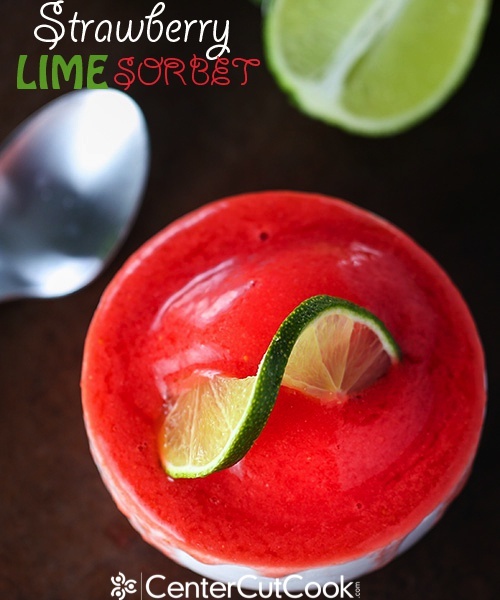 Cool, slightly sweet, refreshing Strawberry Lime Sorbet is ready in 5 minutes and only requires 4 ingredients! 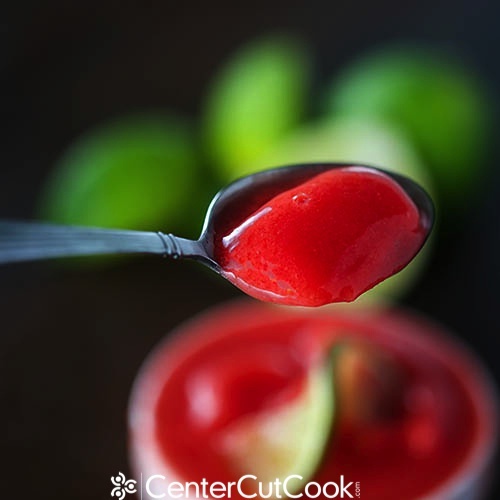 There is nothing I love more than a cool, slightly sweet, refreshing dessert during the summer months which is why I absolutely love this Strawberry Lime Sorbet made with my Vitamix. Despite the fact that I already own a Vitamix, any time I am in Costco or Whole Foods and there’s a Vitamix demonstration going on, I always stop because I am guaranteed to walk away with one new recipe that I want to try. This particular recipe was being made at the last demo I saw- it was so delicious and refreshing, I knew I had to share it with you all! Now, just because I made it with my Vitamix doesn’t mean that if you don’t have one, you can’t make this recipe. Any really powerful blender should do the trick, but you’ll likely have the best results if you use a Vitamix. The ingredients list a short one. 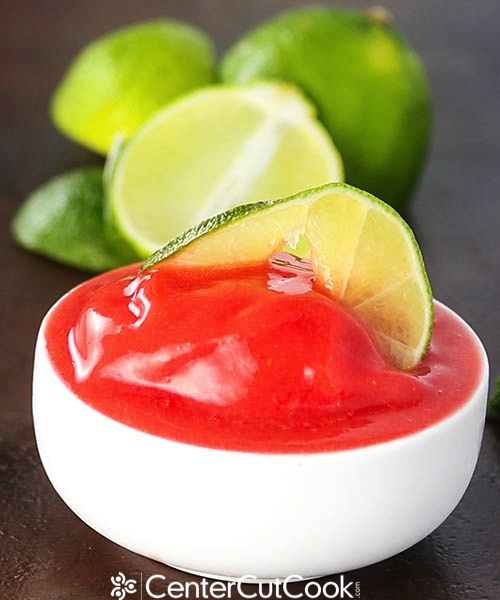 All you need is water, a little bit of sugar, a peeled lime, and a pound of frozen unsweetened strawberries. The best part about this whole recipe? A 1/2 cup serving only has 50 calories! Seriously, 50 calories, that’s it! Hard to beat, right? You’ll get about three and a half cups from this recipe. Another thing I love? It looks SO pretty! And because the Vitamix is so powerful, there’s no graininess or iciness with this recipe. It’s just smooth, simple, and perfect! 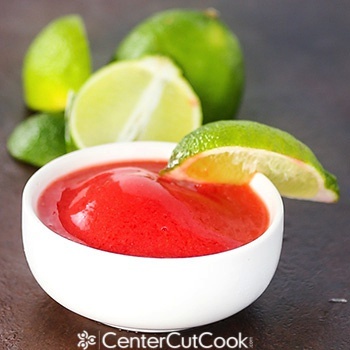 Strawberries and lime are a match made in heaven. Enjoy! DIRECTIONS *If you don’t have a Vitamix, for best results, use a high-powered blender. Place all ingredients into your Vitamix in the order listed. Turn the blender on to Variable 1, then quickly increase the speed to Variable 10. Switch to high then blend for about 30-60 seconds. Use the tamper to press the ingredients into the blades. Eventually four mounds will form around the time that the sound of the motor changes. Stop the machine as soon as the mounds form.